This is my contribution for the Swashathon hosted by Movies Silently. This was another blogathon where I thought I would not have a title to contribute. Part of it had to do with the fact that Swashbuckling is such a niche that I didn’t think I’d have much to contribute as it’s not one I can claim any level of expertise in. I could’ve offered up for Kim but that would require a re-watch and it didn’t jibe with my schedule. That’s when on a double-check (triple-check? quadruple-check?) 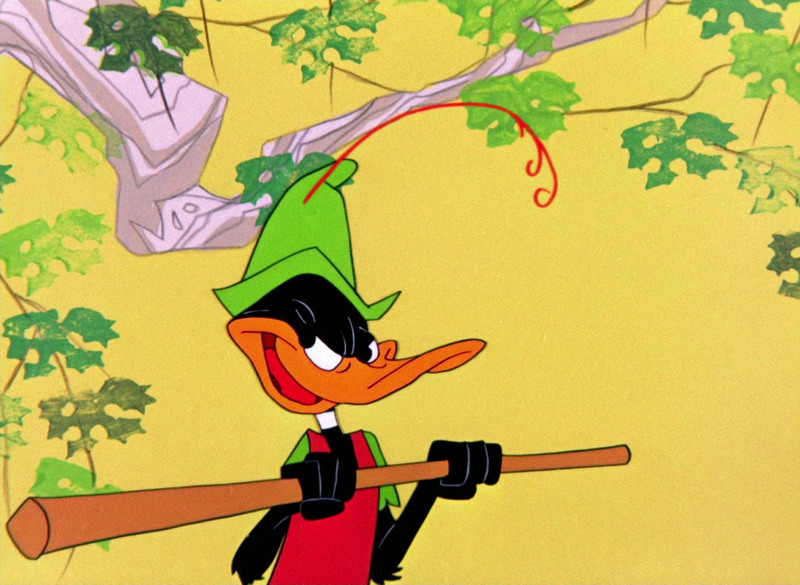 I noticed that Robin Hood Daffy was there and I just had to write about it. Any chance to discuss the Looney Tunes is a good one. 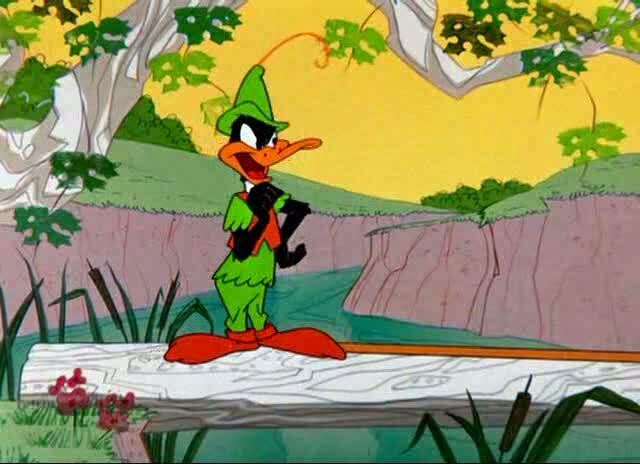 I know this short very well, as I know many, so it prompted me to look up the precise definition of swashbuckling as my understanding over-emphisized sword-play and I knew Daffy’s Robin Hood never had a sword. 1 a swaggering swordsman, soldier, or adventurer; daredevil. As for the Looney rendering of the tale of Robin Hood there are some things that are worth noting without giving a blow-by-blow of a short that runs fewer than seven minutes. Perhaps first and most importantly is the notion of cartoon casting. And by this I do not mean voice actors. For once Warner had Mel Blanc in the fold they knew they had a good thing and he was one-man show. What I mean is match the existing characters in a stable of cartoon talent as the parts in an adaptation, matching the correct types. Daffy as a hapless Robin and Porky as a jolly and sarcastic Tuck is perfect and offers a brilliant send-up of the Robin Hood tropes and story. Another commonality this shares with other great Looney Tunes is the direction of Chuck Jones. Jones being one I so admired he was the first director whose writing I read, in Chuck Reducks. This short is also a reflection of my understanding of film progressing, or maybe it’s more proper to say it is an astute example of children’s innate ability to grasp adaptation and different renditions of similar material. What I mean is that Disney’s Robin Hood was at the time likely my favorite movie, and remains my favorite Disney film. 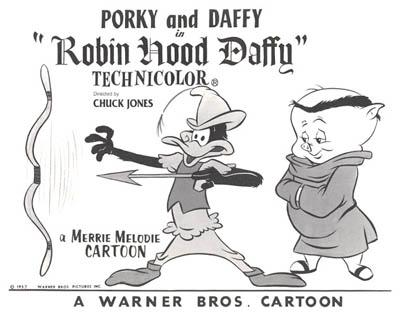 They represent two drastically different approaches to the anthropomorphizing of the Robin Hood characters, in two different film forms, but use the same medium (animation). I loved them both growing up, much in the same way as I enjoyed the goofy 1966 Batman TV series as well as the 1989 Tim Burton film, and the new school. I later saw the Errol Flynn-starring Robin Hood in High School. The gags are spectacular, and some are among my all time favorites such as Daffy’s minstrel song, “Ho, ho, very funny. Haha, it is to laugh”, “Yoicks! And away!”, and more. The work is elevated to the level of genius in set-up (Tuck/Porky doesn’t believe Daffy is Hood). And then the payoff at the end. It so perfectly befits them both and should be known to children and film buffs everywhere if it isn’t already.